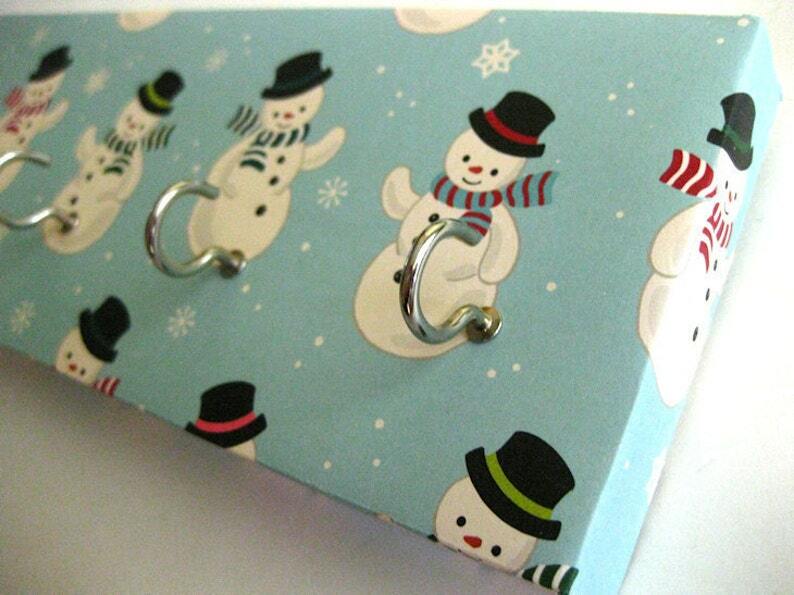 Stocking Holder, Key Rack and Jewelry Holder Christmas, Holiday, Scarves, Snowflakes, Stocking Hangers, Red and Green "Snowmen"
These sunny little snowmen can be used to hold your keys or jewelry, and even your cheery Christmas stockings! Five nickel hooks line the bottom, but can be changed to brass if you would like. Stocking Holder, Key Rack Jewelry Holder Holiday Key Rack Christmas Decor Holiday Decor Birdhouses Christmas Birds "Christmas Cardinals"
Key Rack and Jewelry Holder Family, Traditions, Love, Hearts, Home, Umbrellas, Boots, Hearts, Red, Blue, Green "Home Sweet Home"
Jewelry Holder and Key Rack Sea Glass, Blue, Teal, Aquamarine, Ocean, Pattern, Organization, Beach, Sea, Sea Colors " Sea Glass"
Hawaiian Jewelry Holder and Key Rack Plumerias, Hawaiian flowers, Colorful , Blue, Green, Pink, Orange Hawaiian Flowers "Hawaiian"
Cute item and after i received umut, i looked back at the item description to see that "sea glass" was in quotes. Thought it would be made using glass pieces but it's just painted colors on the board. So cute but not what i expected (my bad for not reading closely), and a little pricey for what it is. Arrived after the time expected so we couldn't use them. But would have been a cute addition to table decorations. They are definitely "mini"-- If I wanted to used them in the future, I would probably order several more sets. Circus Key Rack and Jewelry Holder Kids Room Decor Nursery Decor Childrens Decor Ringmaster Elephants Monkeys Bears Polka Dots "Circus"
Daisy Jewelry Holder Flower Key Rack Black and White Daisies, Flowers, Sunflowers, Silhouette, Gray, Charcoal, Garden, Floral Blooms "Daisy"
Jewelry Holder and Key Rack Blue and Black, silhouette portrait, masculine, man, men, classy, blue, black, white "His"
Cherry Blossom Jewelry Holder and Key Rack Blue and Pink Cherry Blossoms, Japanese, Watercolor Painting "Cherry Blossoms"
Jewelry Holder Key Rack Love Key Rack Valentines Day Blue, Pink, Yellow, Purple, Love, Kiss, Hearts, Inspirational Words Gift for Her "Love"